Air pressure is often discussed in middle school science, but since it is something not easily observed, it is difficult for some students to understand. 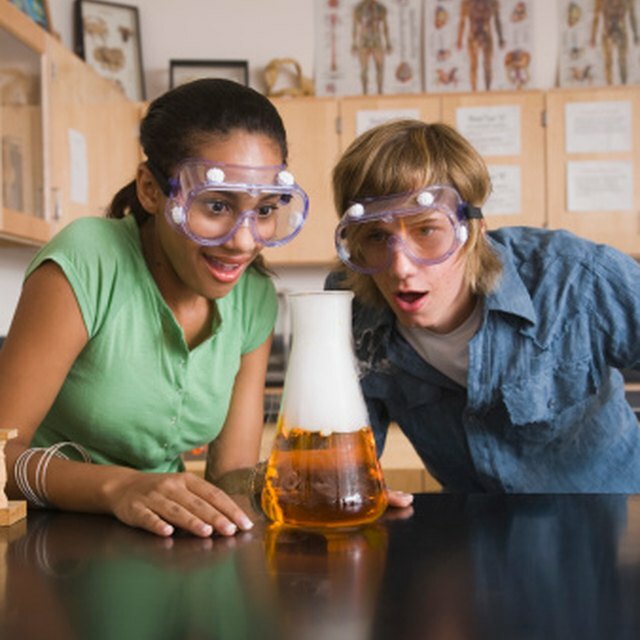 As students participate in experiments, they will be able to observe how air pressure can be high or low, and how it affects the items around it. This learning can be transferred to a better general understanding of air pressure and how it changes the weather and the world around us. While middle school-aged boys may like to show off by crushing a can with their hands, they will also be impressed by crushing it using air pressure. With adult supervision, students should place a tablespoon of water in a soda can and heat it on a hot plate. Once water vapor starts appearing, let it heat about a minute longer. Use tongs to grab the hot can at the bottom, and quickly push it upside down in a bowl of cold water. As the water vapor quickly cools, the pressure on the inside of the can drops and the air pressure outside the can causes it to implode, according to Steve Spangler Science. For this air pressure experiment, students should fill a 2-liter plastic bottle with water halfway. Place a large straw in the water so that it extends out the top of the bottle. Cover the opening of the bottle around the straw with clay so that no air can go in or out except through the straw. When students blow in the straw, it will raise the air pressure in the bottle. That air pressure will push down on the water, and with no other place to go, the water will escape through the straw. Most students would probably think that air isn't very strong; use this experiment to show them how much weight air can hold. Students should use an air pressure gauge to measure the air pressure in four tires on a vehicle. Then, measure the area where the tires meet the ground in square inches. When students multiply the air pressure of the tire by the surface area of the tire, they will find how much weight (in pounds) each tire is holding. Add up the results of all four tires to find the weight of the car. They will find that air can be very strong under pressure. Peel several hard-boiled eggs for this fun experiment. Place the egg on the mouth of a glass bottle that is slightly smaller than the egg so that the egg cannot fall in the bottle. Remove the egg and throw a lighted match into the bottom of the bottle and replace the egg. As the flame uses up the oxygen in the bottle, the flame will go out and the air pressure in the bottle will drop. According to Science Fair Adventure, the egg will appear to be sucked into the bottle, but the higher air pressure outside the bottle actually pushes the egg in while trying to equalize the air pressure. Based in upstate New York, Laura Wilson entered the writing community in 2010. She writes about children, education and health-related topics for various websites. Wilson has a Bachelor of Science in elementary education from Houghton College. Wilson, Laura. "Air Pressure Experiments for Middle School." Sciencing, https://sciencing.com/air-pressure-experiments-middle-school-8725272.html. 24 April 2017.